WRIGHT ANSWER--What does a beautifully appointed San Francisco gallery dealing in fine Asian antiques have in common with the Solomon R. Guggenheim Museum in New York City? Easy answer: architect Frank Lloyd Wright built them. The Guggenheim’s circular masterpiece was completed in 1959. Wright’s V.C. Morris Gift Shop opened in 1949 at 140 Maiden Lane (east of Union Square). Current owners of Xanadu Gallery remodeled the sole Wright building in downtown San Francisco a few years ago. The Xanadu redux belongs in the tenant improvement hall of fame for restoring the oft-changed shop to its Wrightian roots. On a recent visit, the Xanadu staff couldn’t have been more chatty and accommodating to a couple of architectural tourists. They pointed out how Wright refused to design traditional store windows. Instead the all brick exterior lures visitors inside with its ever-intriguing main entry shaped more like mouse door. And just like Wright sited his Fallingwater residence over a woody brook, this time the old master stole the show by creating an ascending circular ramp linking the circular main and mezzanine levels. The circular space allows Xanadu to display Asian antiquities in an unending and uncrowded parade. 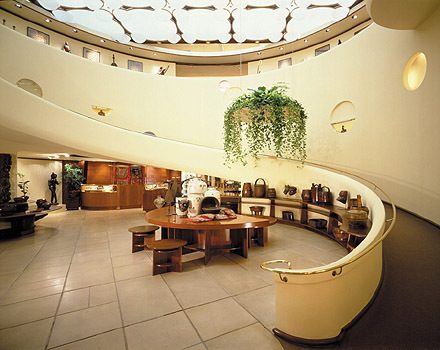 Plus, the project gave Wright his first chance to construct an interior spiral ramp ten years before Guggenheim. Photo Credits: Black/white image Library of Congress; gallery main floor image by Phyllis Shess and interior ramp image courtesy of Xanadu Gallery.